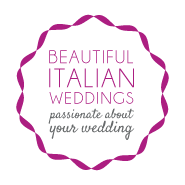 A wedding in Italy is a dream come true, and your Italian wedding will be full of genuine emotions in breathtaking settings. Let us show you how our passion for this work, combined with the charm of this country, can lead to the most stylish and amazing day of your life! With our help, the task of planning your wedding will be totally stress–free and yours will be a Beautiful day to remember!